At the beginning of a remarkable and emotional concert at the Jewish Museum on 31 October, 2004, the South African-born concert pianist Tessa Uys walked onto the small stage carrying a red rose, and gently laid it on her late mother’s grand piano before she began to play. The concert grand built in 1913 by Blüthner, the famous Leipzig piano manufacturer was originally bought in Berlin by Tessa’s mother, the concert pianist and piano teacher Helga Bassel, in 1930. In 1935 Helga Bassel was expelled from the Reichsmusikkammer - an important profesional organisation - by the Reichskulturkammer which was the Nazi German cultural authority set up in 1933 to root out Jewish artists and performers. In 1936 Helga fled to South Africa where she was able to carry on with her distinguished musical career. 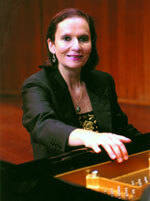 She managed to take the Blüthner with her - the piano on which she taught her daughter, Tessa who was born in 1948. Before her suicide in 1969, Helga Bassel never spoke to her children about her troubled past. Both Tessa and her brother were brought up in the Calvinist tradition of the Dutch Reformed Church. It wasn’t until last year that Tessa went to the Jewish Museum in Berlin after shortly before going through her mother’s papers. With the assistance of Aubrey Pomerance, head of archives, Tessa found out that her mother was full Jewish. 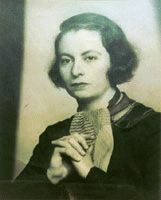 After negotiations with Aubrey Pomerance, Tessa concluded that her mother’s piano should return to Berlin, to complete the circle. In February, 2004 she played her mother’s Blüthner in the family home in Cape Town for the last time, surrounded by close friends and candles. Early the next day, the grand piano began its long journey back to Blüthner in Leipzig to be lovingly restored before being permanently installed in the Jewish Museum. AVIVA-Berlin: You began the concert with the African hymn ’Nikosi Sikelel’iAfrika (God Bless Africa) because you said you wanted to remind the piano where it had had a haven for 68 years. Do you believe that this piano has a soul? Tessa Uys: I certainly do. It has proved to be such a living entity through the music, through this journey I’ve experienced in the last year. Last night, it was like a catalytic love with all those people, friends who came from all over the world. Yes, it has a soul, a very warm heart (laughs). AVIVA-Berlin: How did you feel? What was going through your mind, your heart, as you were playing? Tessa Uys: I just felt so overwhelmed, and actually I had been dreaming about that moment and crying for many months before that moment. It was months and months of preparation: Would that moment actually come to pass? And when it did come to pass, I cried last night and I’d been through every possible emotion beforehand. So I managed to just savour the moment. I was in seventh heaven when I was playing. AVIVA- Berlin: Was it hard for you to give your mother’s piano to the Jewish Museum? Tessa Uys: It wasn’t hard to give the piano to the Jewish Museum and to bring it back to Berlin. It was just hard for me to let go of the piano. But knowing where it’s come, it is a dream come true because it couldn’t be in a better place, and it has been beautifully restored. It’s going to be here, it’s going to here to be shared by all of us. AVIVA-Berlin: The piano has survived two world wars, Hitler, Nazism and the apartheid regime in South Africa. Do you think its struggles are over? Tessa Uys: The piano has had its fair share of history, it’s now standing in the Jewish Museum and it has a role to fulfil there as well. As a pianist, and as a musician I hope that in sharing what the piano has to offer, which is the music, that it will be able to fulfil a role. I have felt about the piano, and the story of my mother’s piano, that it has actually been a symbol of universal triumph over oppression of all people who have been denied the right to exist and embrace music and culture. So I think its ongoing role is to offer the beauty of music to all. AVIVA-Berlin: Your mother died in 1969. But it wasn’t until two years ago that you started to go through your mother’s papers. May I ask you why you waited so long to find out the truth about her life, and your own? Tessa Uys: Well, I knew that when I found folders with my mother’s name on them it would be loaded with many things. The time had to be right. There’s always a time and a place for everything. That was the time for me to go through the papers which was as recent as that because before hand it simply wasn’t the right time - when my father was alive and my father’s sister was alive. AVIVA-Berlin: What has the impact of discovering that you are Jewish had on you? Has it changed your life? Tessa Uys: To receive confirmation that my mother was fully Jewish, to think that her grandparents were Jewish - and her grandfather was a Cantor in a Synagogue in Vienna - is just extraordinary. We knew that my mother had Jewish blood in the family when we were young but because it was not discussed, there was always uncertainty and vagueness - just talk of being a converted Catholic, a Christian. But as I say, it was last year that this was fully confirmed and it has been such an enriching confirmation. I just feel that I have so much to learn about Judaism. My knowledge is so unbelievably limited and I feel there are so many things that I now would like to learn. I feel that I have been embraced by this gift of my mother’s identity. I had many invitations to attend my first Pesach (Passover) in April. And I’ve been to a number of Shabat celebrations with families in London and one in Cape Town, which is something I had never attended before. From a humane point of view, these were just like a loving family experience. AVIVA-Berlin: If you could meet your mother now, if she suddenly appeared and was sitting beside you, what would you like to say to her? Tessa Uys: I would like to say to her, "Thank you for the gift of music." That has been the most sustaining and wonderful gift she ever could have given me, apart from my life. And I think if I had my life over again, I would have chosen the same mother, and the same father. AVIVA-Berlin: Do you have plans to come back to Berlin and give recitals on the piano? Tessa Uys: Oh yes, I definitely do and I was so happy when the executive director of the Jewish Museum said I could come back, preferably twice a year. It’s just so wonderful, and London is closer to Berlin than it is to Cape Town. So instead of going to the family house where there is no piano, I’ll just pop over to Berlin instead. AVIVA-Berlin: I’d like to change the subject slightly. What are you reading at the moment? Tessa Uys: I’ve been reading Emmet Fox’s "The Art of Positive Thinking" (laughs). AVIVA-Berlin: Is there a particular book that you own that you would never lend to anyone? Tessa Uys: I have got one or two books like that. One of the books I found in the family house in Cape Town about 25 years ago was a Berlin telephone directory from 1938 which my grandparents brought out in 1939 from Berlin. That has been one of my most cherished books simply because the whole telephone directory is like a historic document with all the names of everybody: Kurt Weil for example. Hitler’s phone number is fortunately not in the book. If one suffers from insomnia and you go through that telephone directory, it either keeps you awake for ever or you go to sleep very, very quickly (laughs). The other book was a book my father was given shortly after my mother died and it was Viktor Emil Frankl’s book "Man’s search of meaning". Frankl had been in Auschwitz and it was his philosophy of how people actually survived in the camps. It’s a very powerful book with an incredible message. That is a book I would never lend to anyone because it has an inscription in the front from my aunt to my father. AVIVA-Berlin: If you were given a cheque for an unlimited amount of money to spend on a project that would help Berlin in some way, what would you spend the money on? Tessa Uys: If I had more pianos, I would like to give them all to as many museums, institutions as possible. I would want to share music with as many people and as many communities as possible, to introduce and give the gift of music which is my means of sharing. If I could do anything in that line to help, to heal through music, then that’s what I’d like to do. AVIVA-Berlin: Tessa Uys, thank you very much. Helga Bassel’s Blüthner will be displayed as part of the ’Bosom of the Family, 1850-1933’ permanent exhibition, and will also used for all the museum’s concerts.